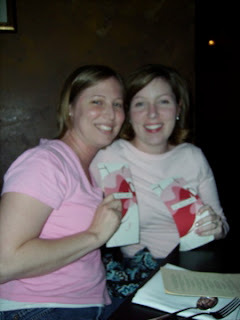 Girls Night Out- The Chocolate Bar! Last night Matt stayed in to work on his 10 page thesis paper and I went out with the girls! We enjoyed taking, laughing and our chocolate martinis. What a blast we had at Baileys Chocolate Bar last night! Today at Covenant Seminary there was a big groundbreaking ceremony for the new administrative building they are in the process of putting up. The ceremony started at 11:00 am with chapel and then continued with a lunch and hangout. Here are some pictures from today! We began the ceremony with worship. Dr. Chapell opened the chapel ceremony. 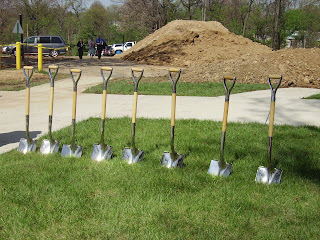 What is a groundbreaking with out the shiny shovels? They took pictures of a bunch of people involved here at Covenant. This is a group of elderly women who help out during all the functions at Covenant. That is their ministry in the community...how awesome is that?! They wanted the students to be involved in the ceremony so they had us sign actual drywall that is going to be put up in the new building...i thought that was kind of dorky! Before the lunch was over I had to get a picture with my "2:45 club" These girls work with me and we all take a break together at 2:45 to hang out and chat! Matt works for a family down the road. He does little jobs around their house (for example: landscaping, cleaning out cars, pulling weeds, hanging lights and pictures, and fixing things, etc.). Well at work on Thursday he was clearing their back yard when he came across some poison ivy (he did not realize it at the time). On Sunday afternoon we noticed his arm looked like it was swelling from the amount of poison ivy he had. It was also spreading to his legs, stomach, face, and other arm. He went to the doctors on Monday to find out his arm was infected. After a lot of money in medicine we finally feel like it is under control. Matt has been pretty miserable. He is having a hard time staying focused because of how irritable the itch is. Please keep him in your prayers for the next couple weeks. Finally, some pictures of our home in St. Louis, Missouri. We still have some more things we want to change about it (ie- the yard), but we feel we have made this house our HOME! Guest Bathroom- what else do you do with a bathroom with pink tile? Paint the walls brown, find a cute shower curtain and hope for the best. We think it turned out cute! The Basement-another work in progress...we would LOVE to finish it! Well, we hope you liked the grand tour of our house. I did not put a picture of Matt's office because it is always messy and well I forgot. Enjoy!